MRI Axial T1 post contrast images show intensely enhancing basal exudates with multilocularity on left side of mid brain which is very typical of tuberculosis. An associated diffuse lepto meningeal enhancement and an associated hydrocephalus. The same Mycobacterium tuberculosis, from distant source commonly the pulmonary tuberculosis, the infection may spreads haematogeneously to CNS, in brain gets lodged deep to the pia. These foci then rupture into subarachnoid space forming basal exudates. These basal exudates are hyperdense on CT and hyperintense on MRI FLAIR, often located in basal cisterns obliterating the normal Csf density or csf signal intensity from cisternal spaces. Among basal cisterns commonly includes suprasellar cistern, supra chiasmatic cistern and interpeduncular cistern, posteriorly in pre pontine and ambient cistern. Laterally on anteromedial surfaces of temporal lobes, along sylvian fissures and along hemispheric cortical sulci, anteriorly along inter hemispheric fissure and on inferomedial surface of frontal lobes. 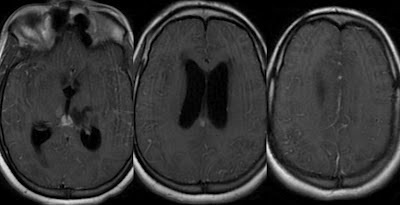 Ependymal lining of lateral ventricles and choroid plexus involvement is uncommon. The adjacent brain parenchyma may show variable degrees of edema, MRI Flair sequence is most sensitive for this. Following contrast administration additional features like intense enhancement along these basal exudates, its multilocularity, leptomeningeal enhancement focal or diffuse along sylvian fissures, tentorium and cerebral convexities. Ependymitis may be visible. Among complications includes Vasculitis induced infarcts for which MRI Diffusion is most sensitive and Hydrocephalus which may seen even on CT but whether it is compensated or non compensated hydrocephalus that is best demonstrated on MRI FLAIR by T2 hyperintense peri ventricular ooz of csf.